This is absurd! Texans have been fighting tooth and nail to stop CSCOPE and Common Core from getting into our public schools, and Ken Paxton, in his own words, says he probably won’t get involved in defending a Texas law that bans common core? In comparison, Texas Attorney General Candidate Barry Smitherman has taken a STRONG stand against CSCOPE and Common Core and has vowed to fight it tooth and nail as Texas Attorney General. As the chief law enforcement officer for the State of Texas, the Attorney General must ensure that the laws of Texas are obeyed and enforced. Current Texas Attorney General Greg Abbott even stepped in and helped stop the illegal activities of CSCOPE. 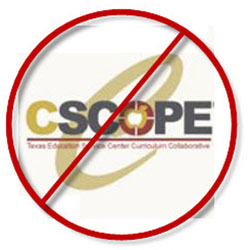 Abbott sent a letter to TESCCC and reminded them of Texas law that allows parents to see any of the CSCOPE lessons that TESCCC is putting into Texas Public Schools. This help from Texas Attorney General Greg Abbott helped expose and defeat CSCOPE.